The Disneyland Dream Suite hosts the first "official" winner tonight. Photo © Disney. Note: The photos you see here were taken earlier this week, when MousePlanet toured the Dream Suite alongside other invited media outlets. 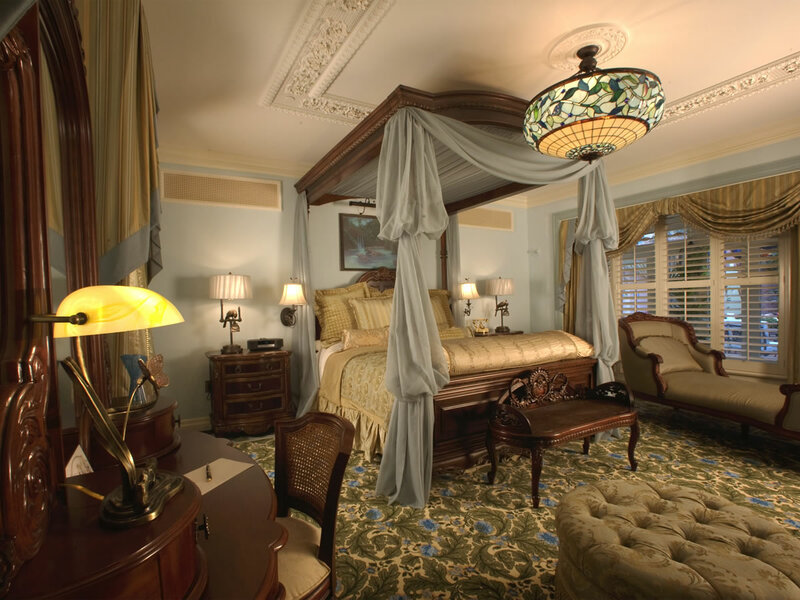 In addition to our own photos, we are including official Disney publicity photos so you can see the suite as the Imagineers envisioned it, since furniture was repositioned to accommodate camera crews and gear. Click on any image to see a larger version. Sometime todayperhaps even while you're reading this articlethe Dream Squad will award one unsuspecting Disneyland visitor the opportunity to be the first "official" guest in the new Disneyland Dream Suite, the most anticipated new prize of the expanded Year of a Million Dreams promotion. Though the winner of a cast member contest got to stay overnight in the suite last week, and Ellen: The Ellen DeGeneres Show awarded a stay on Wednesday night to a viewer, today's winner will be the first guest to win the prize at Disneyland. Dorothea Redmond 1960s sketches were the basis for the Disneyland Dream Suite's dé. Photo © Disney. 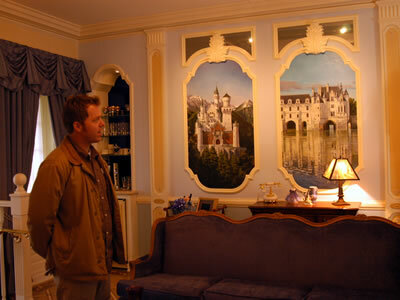 The parlor is decorated with hand-painted murals of European castles that inspired Walt Disney. Photo by Adrienne Vincent-Phoenix. Walt Disney Imagineering Art Director Kim Irvine said, "Our plan has been to use the renderings that Walt worked on with Dorothea Redmond and to replicate those as exactly as we can. Her illustrations were very specific, with a color and style for each room. The Disneyland Dream Suite includes two bedrooms and two bathrooms, a living room, open-air patio and a balcony overlooking the Rivers of America. The winner can enter the suite via the main staircase leading to the front door, or through a new elevator located on the side of the building. The hallway leading from the elevator is decorated with the Dorothea Redmond sketches developed for the suite. 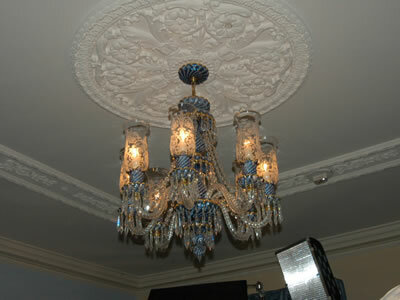 The glass chandelier was made in Turkey, and designed to match fabric used in the suite. Photo by Adrienne Vincent-Phoenix. As the winner enters the suite for the first time, a Disneyland photographer will be on hand to capture a souvenir photograph. 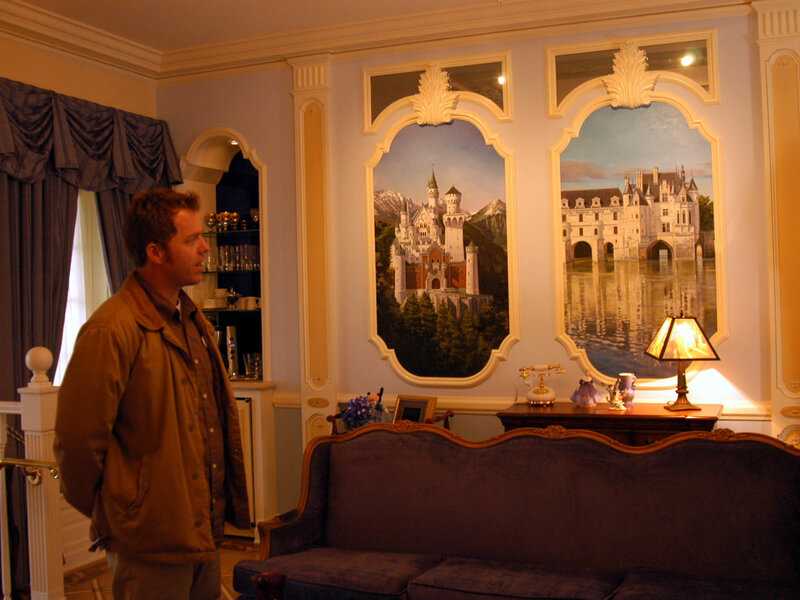 The front door opens into the living room/parlor, decorated in a French Provincial-meets-Fantasyland style. The east wall is decorated with original paintings of Chateau Chenonceau in France and Neuschwanstein in Bavaria, the two castles that inspired Disneyland's Sleeping Beauty Castle. The murals are flanked by a small wet bar and a large standing clock. The living room is lavishly decorated to resemble a New Orleans parlor. Photo by Adrienne Vincent-Phoenix. The faux fire creates sparks that look like fireworks over the Sleeping Beauty Castle fire screen. Photo by Adrienne Vincent-Phoenix. 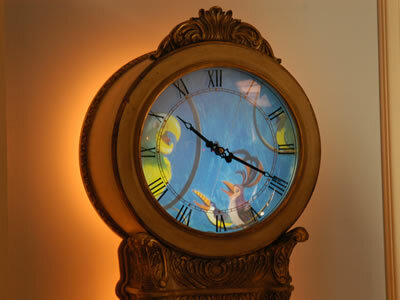 The grandfather clock lights up to reveal new images during the magic moment. Photo by Adrienne Vincent-Phoenix. 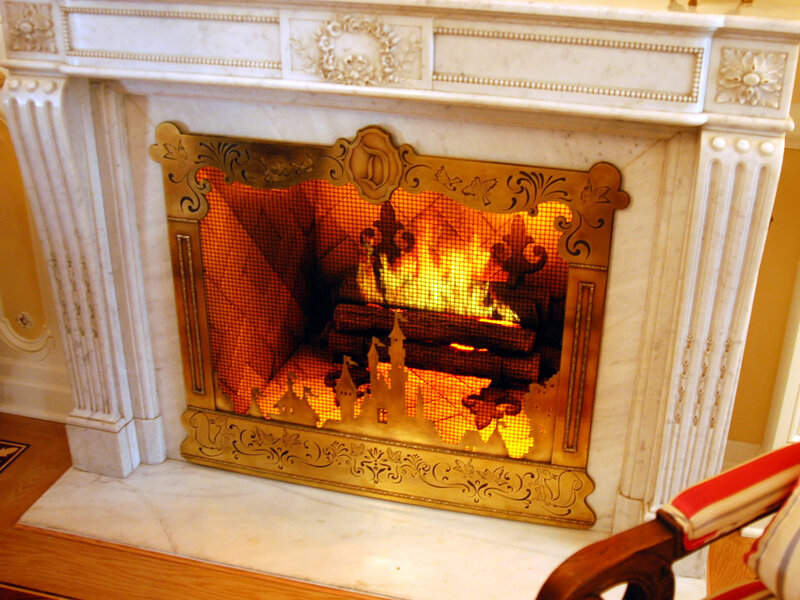 The west wall features a marble fireplace mantle, inset with an artificial fire effect. Sleeping Beauty Castle is depicted in the fireplace screen, and the artificial fire's simulated sparks look like tiny fireworks over the Castle. 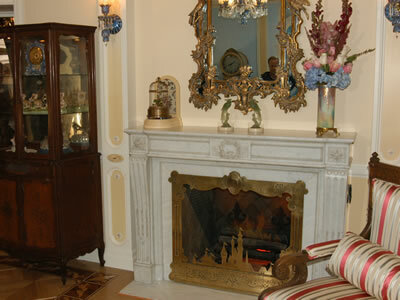 The mantle houses a tiny mechanical bird, and an adjacent curio is decorated with porcelain sculpture. The room's glass chandelier was crafted in Turkey to match a fabric sample taken from the original Dorothea Redmond design. 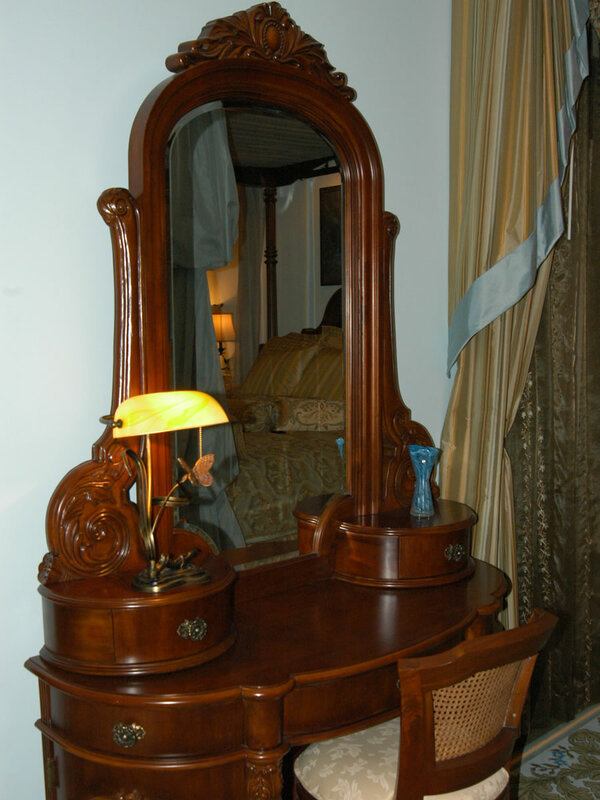 The entire suite is richly decorated with custom woodwork, tile and upholstery, many of the furnishings were created specifically for the Disneyland Dream Suite. A full-size carousel horse stands against the back wall, next to a painted mirror. The Sleeping Beauty-inspired motif in this mirror was painted using the same reverse-painting technique found on mirrors in the nearby Jewel of Orleans shop. Just off the parlor is the first bedroom, also referred to as the informal sitting room. This room is decorated in a masculine Americana motif, and features two beds and an adjoining bathroom. 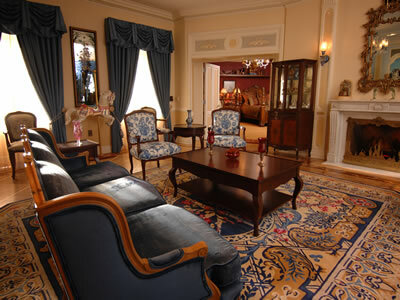 The room is decorated with chairs used in the movie The Happiest Millionaire, and a Franklin stove in the room is embellished with a Cinderella motif. According to Disney, the Cinderella design was original to the stove, and was not added during the renovation. 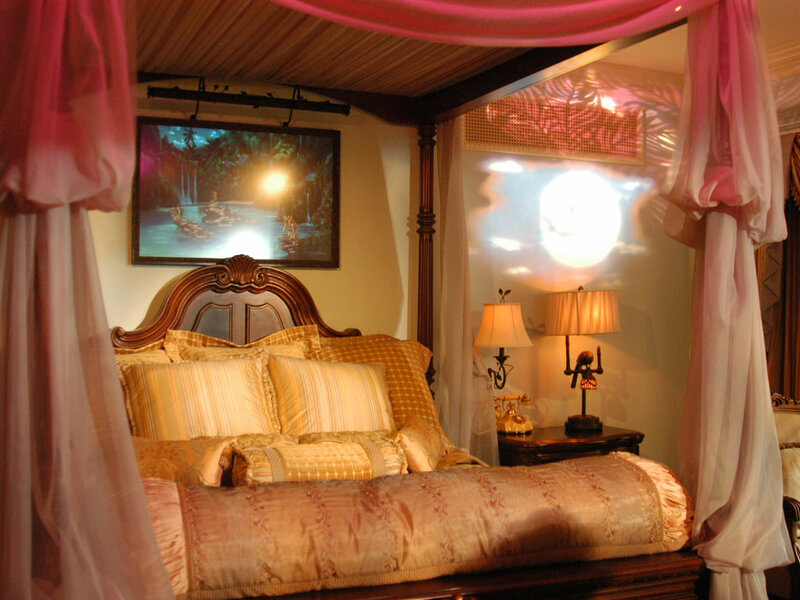 Dorothea Redmond's plans for the room called for a stove, and Imagineers located this one for the room and outfitted it with a "silk flame" effect similar to that used in the burning town scene of the Pirates of the Caribbean attraction. Peter Ellenshaw's painting of Disneyland hangs above the Franklin stove, and, just as shown on The Wonderful World of Disney, the painting transforms at night. 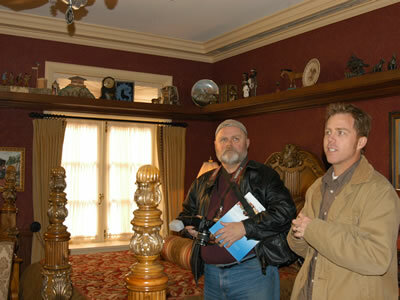 One bedroom is decorated with the types of toys and models Walt Disney was fond of collecting. Photo © Disney. 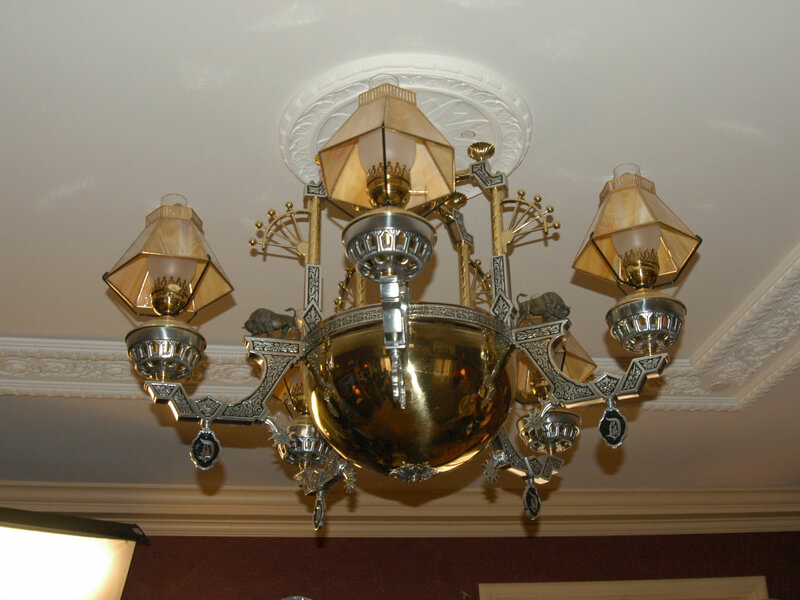 Custom light fixtures are used throughout the suite. Photo by Adrienne Vincent-Phoenix. 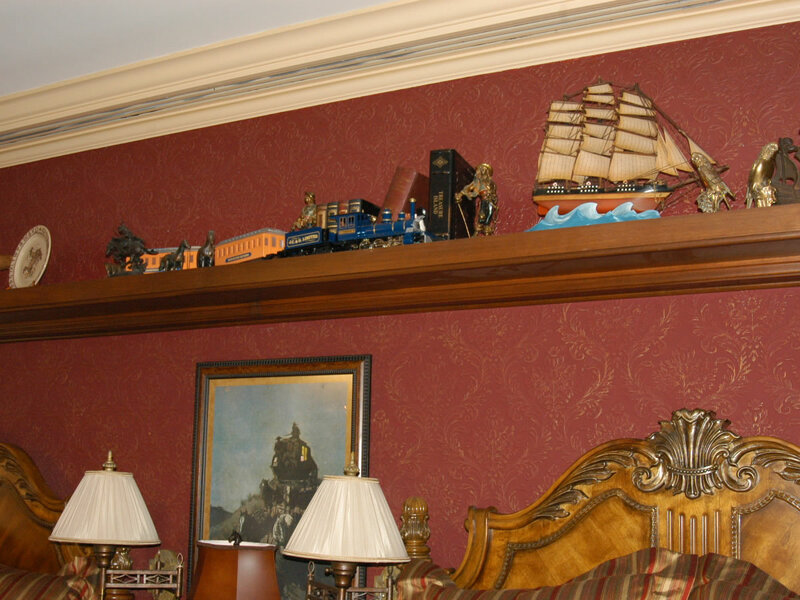 The display ledge around the room conceals the track for the model train. Photo by Adrienne Vincent-Phoenix. The model train chugs around the track during the "Magic Moment." Photo by Adrienne Vincent-Phoenix. A door on the west wall provides access to the balcony, where the winner can enjoy a premium view of Fantasmic! on evenings when the show is the entertainment schedule. A light control near the door had three marked buttons, one of which simply read "Fantasmic." [This button has apparently prompted a number of questions from those who have seen it, namely: "Does it really control Fantasmic, and, if so, can you install one in my house?"] 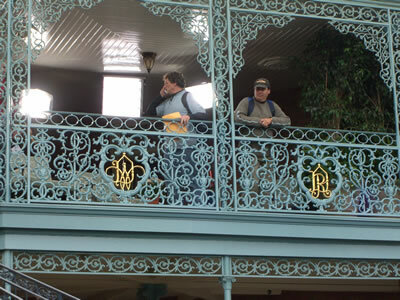 The balcony is furnished with chairs and tables, and the "W" and "R" initials wrought into the railing to honor Walt and Roy Disney have been enhanced with gold leaf. A portion of the patio was used to create an enclosed hallway leading to the master bedroom, and the patio decorated with Chinese lanterns, outdoor furnishings andat nightfireflies like those found in the Pirates of the Caribbean attraction. 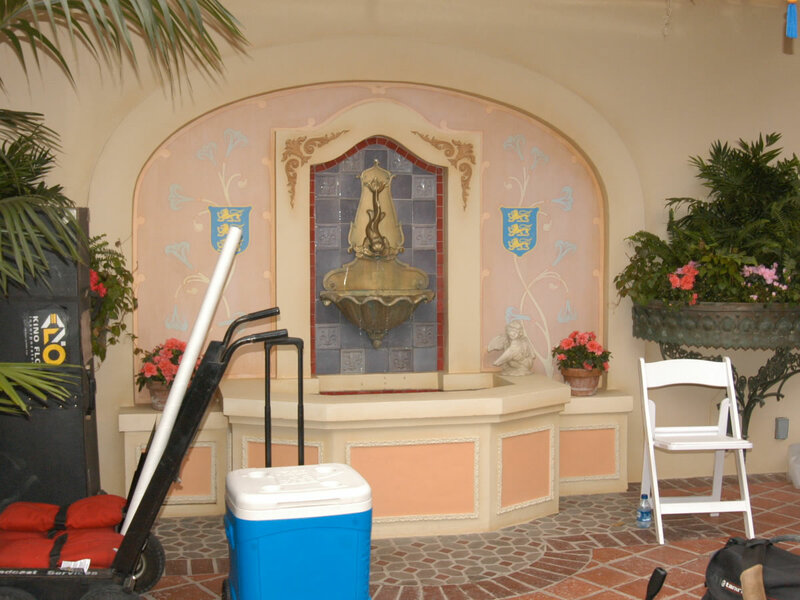 The Disney family crest is depicted in shields painted on either side of the courtyard fountain, and the letter "D" is incorporated into décor in every room, from the tile in the shower to the glasses in the wet bar. 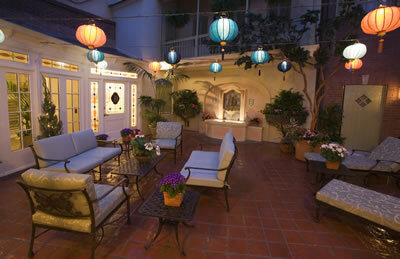 Chinese lanterns decorate the patio. Photo © Disney. The Disney family crest appears on either side of the fountain. Photo by Adrienne Vincent-Phoenix. 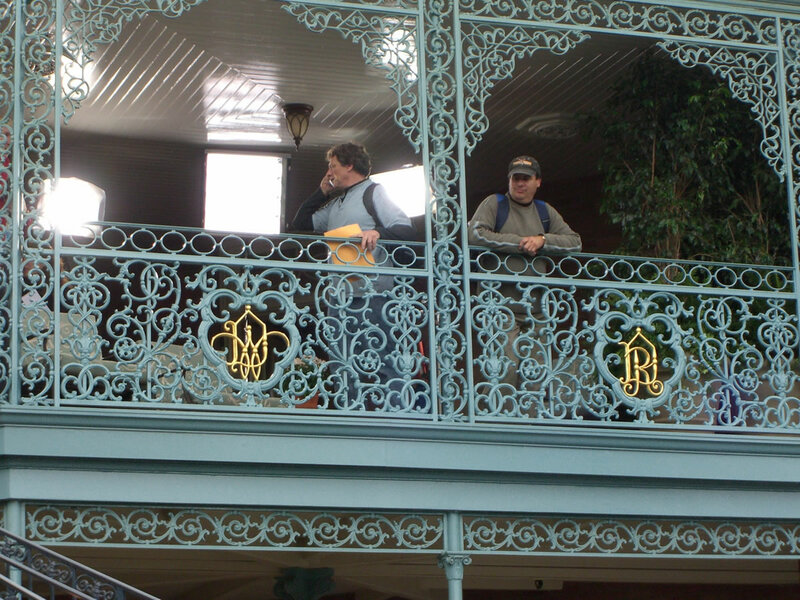 Walt and Roy Disney are memorialized with gold letters on the balcony railing. Photo by Adrienne Vincent-Phoenix. Though Disney states that the Disneyland Dream Suite has two "master" bedrooms, the larger bedroom on the Adventureland side is called the Master Suite. The canopy bed, dark wood furnishings and Victorian accents are lovely, but the master bath is truly the highlight of the suite. The master suite décor is described as "Victorian exotic." Photo © Disney. Dark wood furniture adds to the "Adventureland" theme of the room. Photo © Disney. 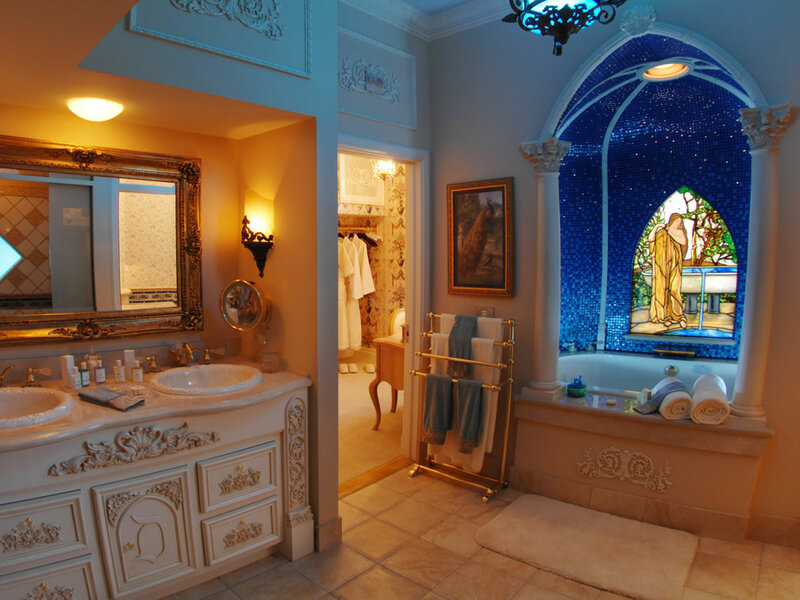 A sunken whirlpool tub is set into a tiled alcove featuring a stained glass replica of Tiffany's "Aurora" panel. 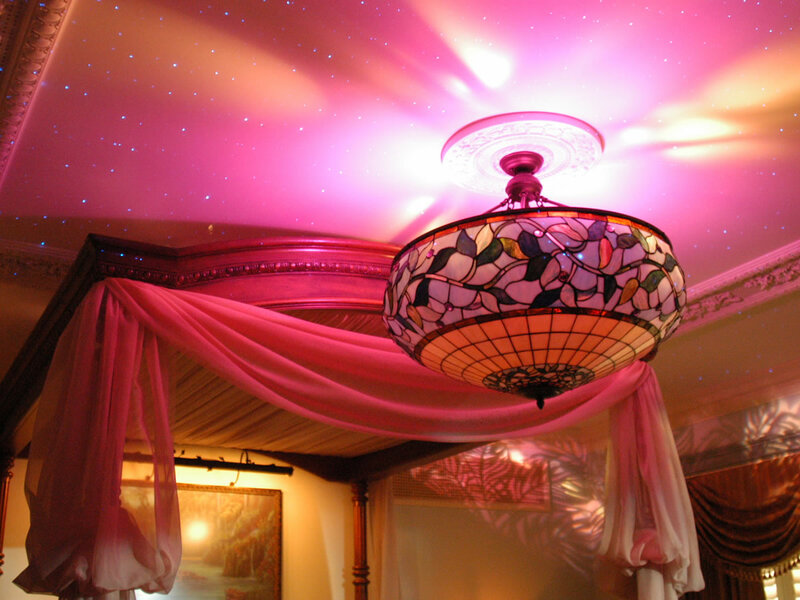 The alcove is decorated with hundreds of stars, and the soothing Symphony No. 6 from "Fantasia" fills the room. 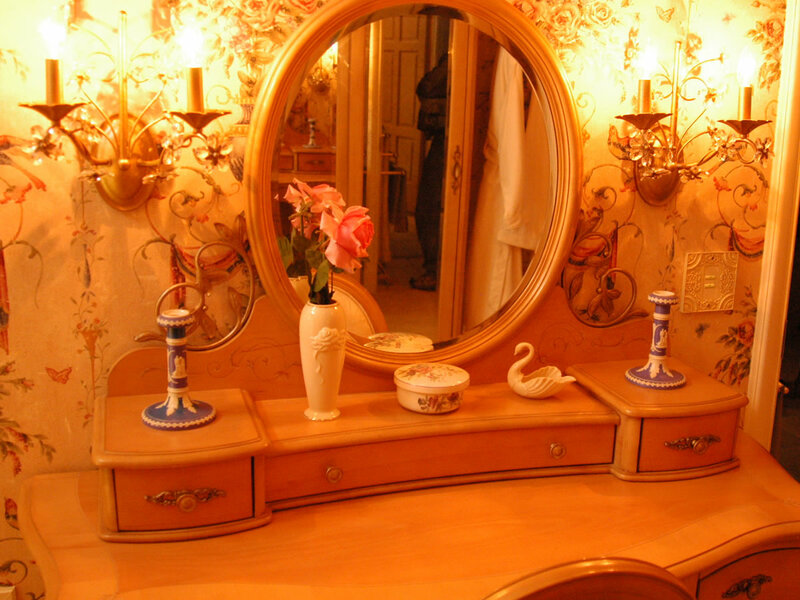 The former office was converted into a large walk-in closet, complete with dressing table. Plush robes hang in the closet for the use of the suite's guests. The master bathroom includes a double vanity and walk-in closet. Photo © Disney. Monogrammed robes await the first guests. Photo by Adrienne Vincent-Phoenix. 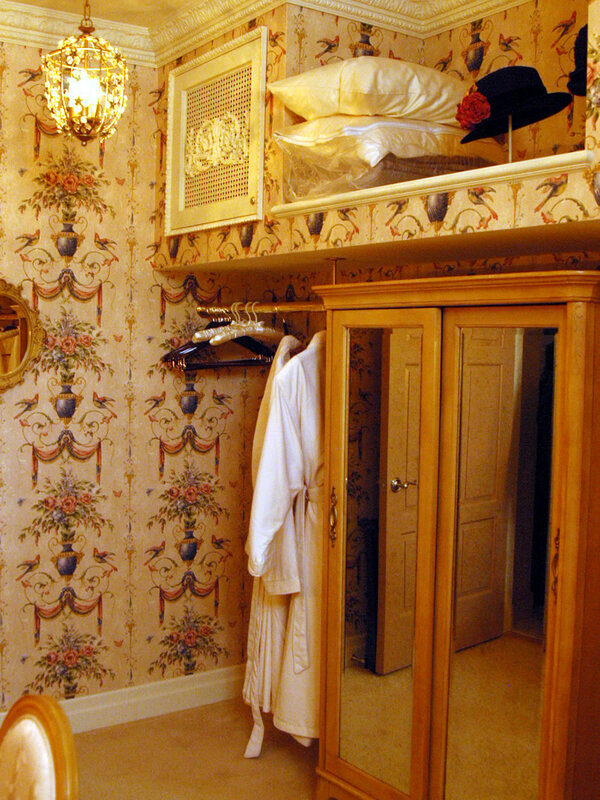 The walk-in closet is even large enough to contain a dressing table. Photo by Adrienne Vincent-Phoenix. 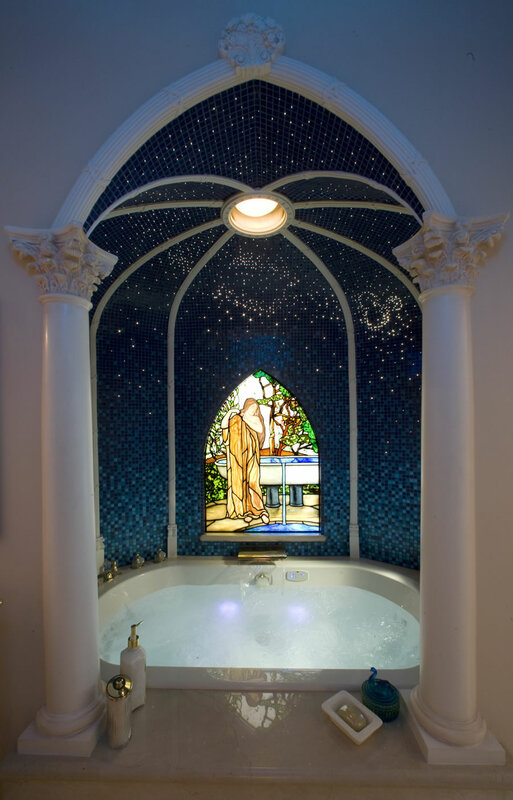 The whirlpool tub is set into a tiled alcove, decorated with a replica Tiffany panel. Photo © Disney. When the "goodnight kiss" effect is activated in the Master Suite, a discreet panel above the bathroom door rises and projectors concealed inside flood the room in a soft waterfall wash of color. 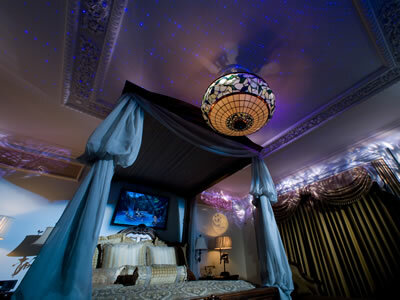 Fiber optic stars "twinkle" from the ceiling, and the original oil painting above the bed is filled with animated mermaids. Just before the lights fade back to normal, you can catch the silhouette of Peter Pan's ship sailing across the "full moon" projected on the wall next to the headboard. Stars twinkle from the ceiling during the "goodnight kiss" effect. Photo © Disney. The hallway leading to the rear staircase and the adjacent former showroom were not incorporated into the Disneyland Dream Suite, and cast members said this area will continue to be used for special event staging. This portion of the former gallery space is locked off from the Disneyland Dream Suite by a door at the back of the patio. 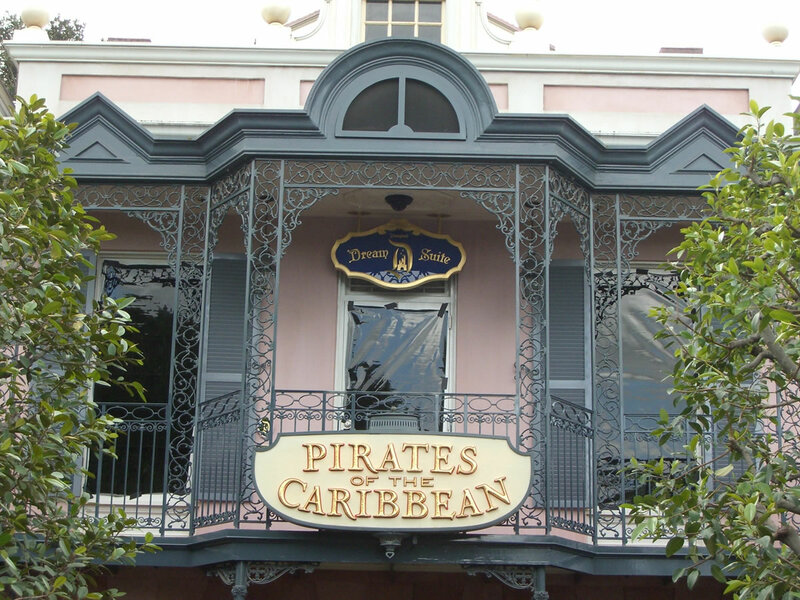 A former stockroom at the back of the patio has been converted into a concierge office, and a cast member host will be available at all times while a guest in in the suite. 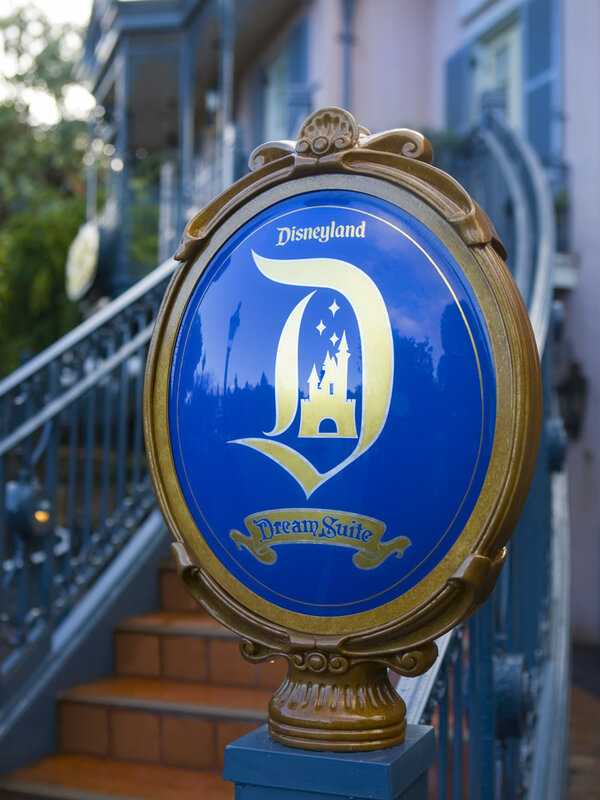 In addition to adding elevator access to the Disneyland Dream Suite, Imagineers incorporated a number of "universal access" philosophies into the design. Both bathrooms feature roll-in showers, and the West bathroom is fully wheelchair-accessible. 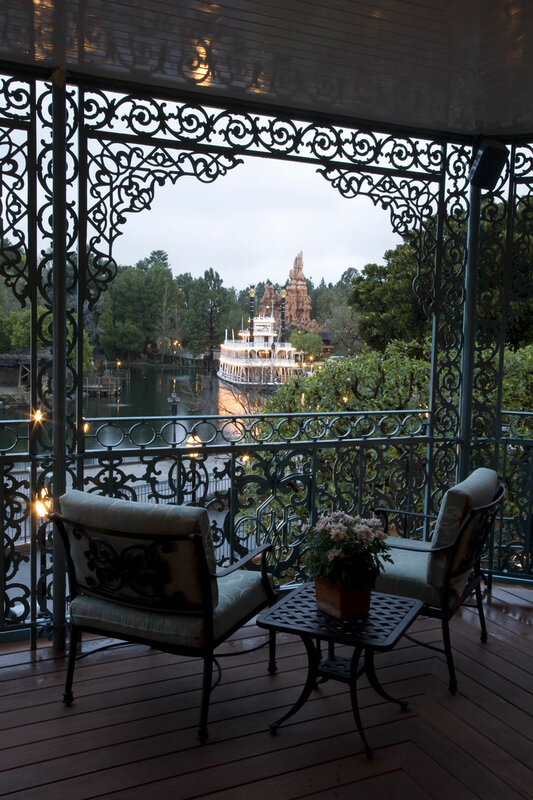 The floor of the balcony is now level with that of the bedroom, resolving a long-standing complaint from when the Gallery's balcony was used for Fantasmic viewing. Winners will have an excellent view of the Rivers of America and Fantasmic! from the balcony. Photo © Disney. The Suite can sleep up to six people, so the winner can invite five guests to share the experience. Winners will also appear as the grand marshal of the parade and receive VIP viewing for the parade; receive a gift basket, dinner at the Blue Bayou and VIP viewing for either fireworks and/or Fantasmic! Winners are not confined to their suite after Disneyland closesa concierge will be on hand at all times to arrange for special after-hours excursions into the theme park if desired. 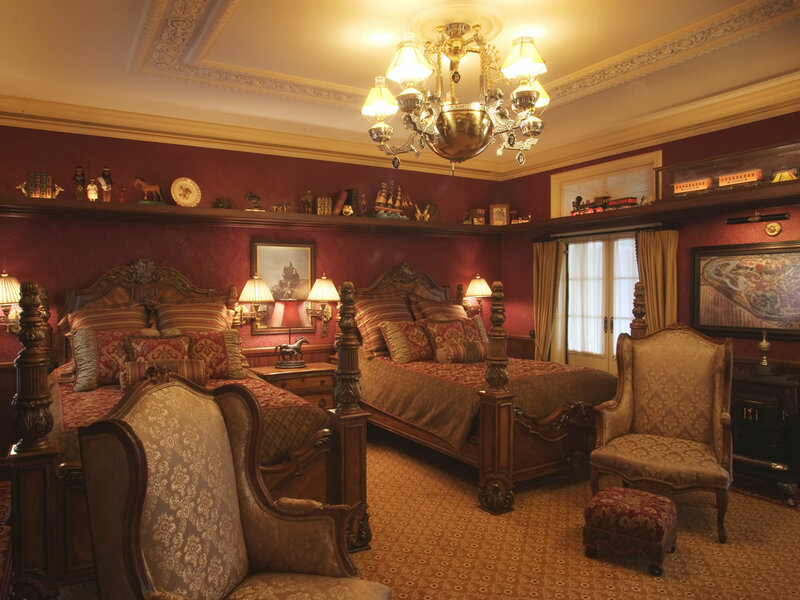 Unfortunately, you won't be able to sleep in after your night in the Disneyland Dream Suite. Checkout time is 9:00 a.m., and winners are then whisked to the Plaza Inn for a character breakfast to conclude their experience. Winners enter the Disneyland Dream Suite via this stairway. Photo © Disney. Disney is planning to award 266 one-night stays in the Disneyland Dream Suite during 2008. It is rumored that the suite will be converted to use as a high-priced hotel room after the promotion concludes, but Disney maintains that this is a "money can't buy" experience. An Imagineer said during the media event that selected Annual Passholders may have the opportunity to tour the suite, and that the Disneyland Dream Suite used for charity groups once the Year of a Million Dreams ends.